A 23 year old man complained of pain in the right testis. �An ultrasound examination disclosed a small, solid, well-demarcated intraparenchymal tumor. �A total radical orchiectomy was performed. 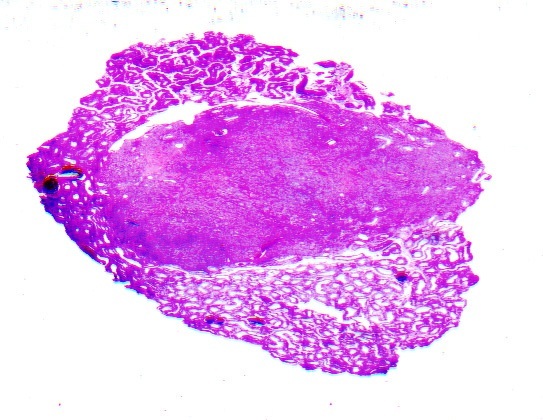 �A small, hard, white, solid tumor measuring 0.7 cm in diameter was found. Diagnosis:� Sclerosing Sertoli cell tumor of the testis. Sertoli cell tumors comprise <2% cent of all primary testicular tumors. 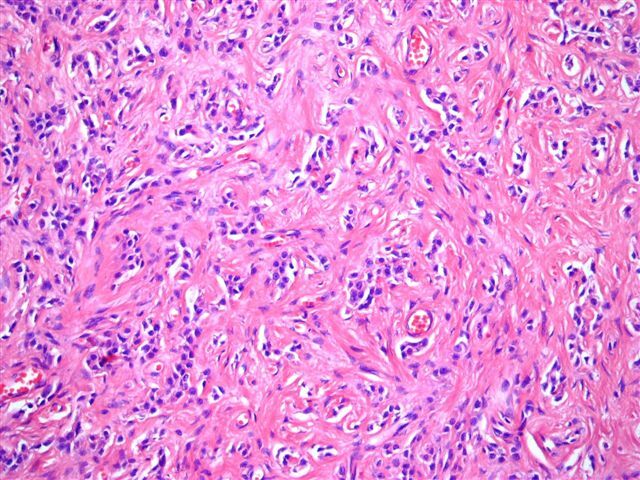 �They have been subtyped as classical Sertoli cell tumor, large cell calcifying Sertoli cell tumor, sclerosing Sertoli cell tumor and Sertoli cell tumors NOS. 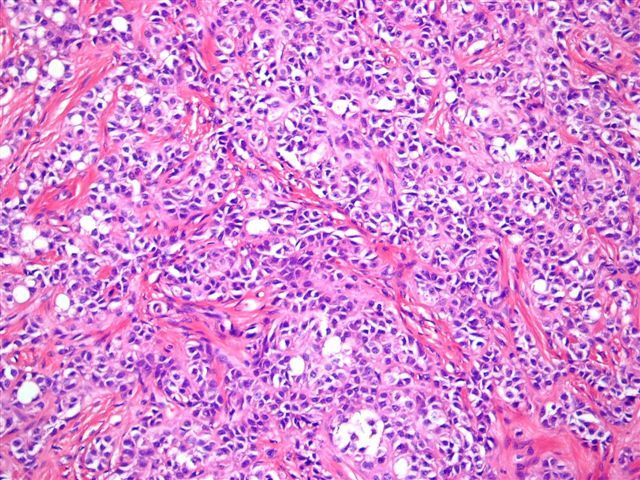 These tumors were first described in 1991 by Zukerberg et al, who reported 10 cases of a new Sertoli cell tumor subtype (AJSP 1991;15:829).�� To date, less than 30 cases have been reported.� They occur in men with a mean age of 30 years, range 18 to 80 years, and are not associated with hormone production.� They are typically well circumscribed, small (0.4 to 1.5 cm in diameter) and yellow-white-tan.� Histologically, they are characterized by small solid cords, anastomosing tubules and thin cords of Sertoli cells in a prominent fibrous sclerosing stroma with thick collagenous bands. 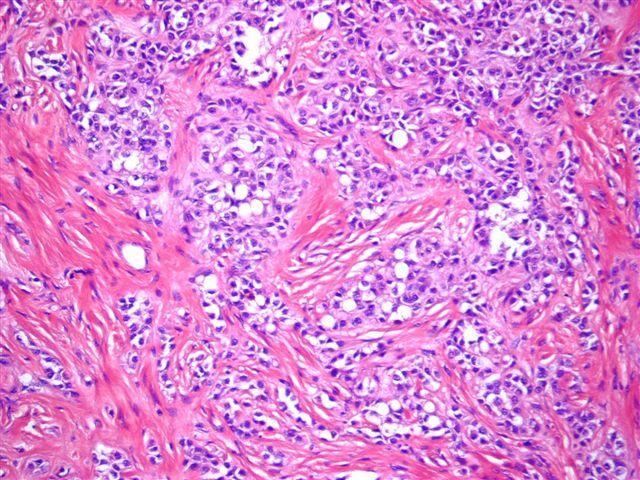 �The Sertoli cells are small to medium size with pale cytoplasm and occasional large lipid vacuoles.� The nuclei are typically bland.� There is usually no/rare atypia and mitotic figures.� The fibrous stroma may entrap non-neoplastic tubules, resembling immature tubules in Sertoli cell nodules of cryptorchid testes (Ulbright: Tumors of the Testis, Adnexa, Spermatic Cord, and Scrotum; AFIP Third Series, Volume 25; 1999).� The differential diagnosis includes adenomatoid tumor (usually paratesticular, no prominent fibrosis) and metastatic carcinoma (marked atypia). 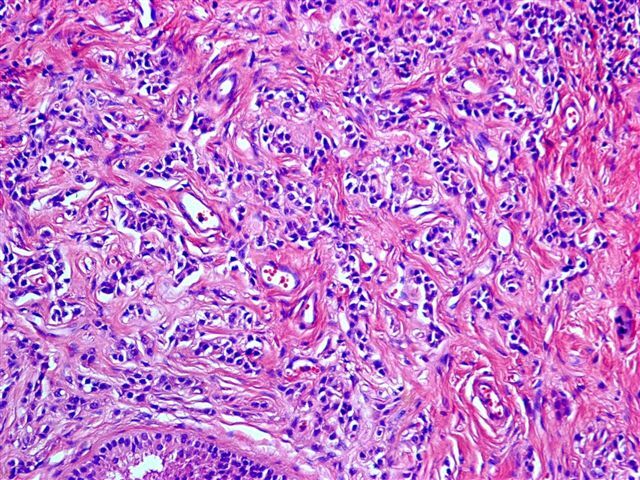 To date, there are no reports of recurrence or metastases. 1. Salvador-Gallegos S, Guerrero-Medrano J. 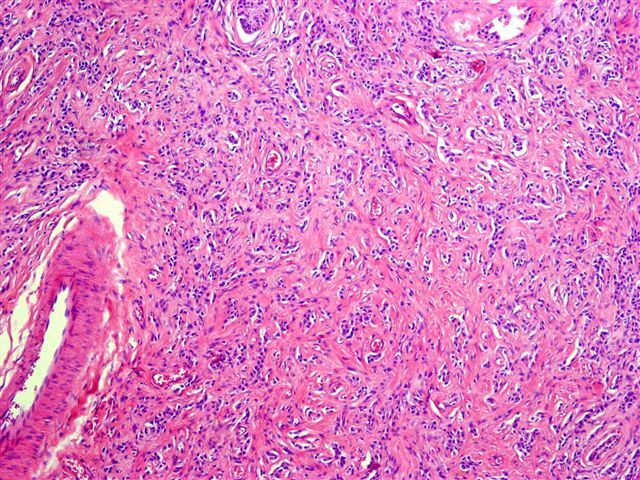 �Tumor de c�lulas de Sertoli esclerosante. �Presentaci�n de un caso y revisi�n de la literatura. �Urolog�a (M�xico) 2004;64:85.